Fifty percent of Karonaâs projects are done for the commercial market, with the other 50 percent being for the residential market. Started in 1980 as a millwork shop with 10 employees, Karona Inc. has progressed remarkably over the years. The family-owned company employs 110 workers at its 100,000-square-foot facility in Caledonia, MI, where it builds stile-and-rail doors for both the commercial and residential markets. "My dad purchased the assets of a company that had gone bankrupt," says General Manager Steve Sisson. "At that time they really did just about anything from a millwork standpoint. Doors were not really the primary focus when he started, but it became that relatively quickly, within the first couple years. We hit the right time with the giant growth of the residential door market. We have diversified over the years from the standpoint of commercial and residential. Fifty percent of what we do is true commercial construction, such as resort work, condominium work and things like that, and then the other 50 percent is traditional residential new construction." Karonaâs interior 1-3/4-inch doors have 30 to 40 percent recycled content as standard, with no premium, from the core materials the company uses. Sisson says that Karona differentiates itself from its competition with the company's diversity, flexibility and manufacturing processes. "We have systems that allow us to do a lot more things than most of our competition can do, and that in turn is probably our greatest advantage," says Sisson. "And we can do it quickly as well. If you need something that is out of the ordinary from us, it is not a 20-week lead time. We typically can do that in our standard turnaround times once we design the product and have our processes in place. "We are also vertically integrated and that gives us a huge advantage," Sisson adds. "So many in our industry are buying component parts, they are buying panels from China, they are buying their veneer cut-to-size. We actually process all those materials from start to finish in-house. Everything is 100 percent American-made. We do not import any component parts." "The company's strategy all along was to be vertically integrated and be able to flex our capabilities to meet demand, both in standard and custom products," says Eric Ash, sales manager. "We continue in that vein. I think because we service both residential and commercial markets, they benefit from each other. "From a species standpoint, none of our residential competitors can match what we do," Ash adds. "We have 23 standard species. We can take an order today and go to the floor tomorrow and start it if we have to. Commercially, we feel we have the best lead times in the industry. We are machining 90-minute fire doors and shipping in five weeks â not many can do that today. I think it all comes back to our infrastructure, which is set up for a lot of variability and product demand and our ability to manage that quickly, with good quality, which is a real critical factor." To meet these demands, Karona uses equipment that includes CNC routers by CMS, Homag edgebanders, Heesemann sanders, a Wemhoner membrane press and flat press, a finishing line by Cefla, Grecon rough mill line, Schelling panel saws a Weinig moulder. Karona has developed the Karona Online Quote Tool, which gives customers the ability to log in to the system and track quotes, add mark ups to the quote by percentage, set defaults for every door on the quote, access all the company's models, verify dimensions with dynamic drawings, change door attributes, price machining options and more. "It is very user-friendly," Sisson says. "It is probably one of the only ones for stile-and-rail door manufacturers that is web-based, so it is always current with where we are with products and pricing, as well as updates that we may have. It is a pretty powerful tool. As we look at our budget for 2010, we will start to reap the benefits of that tool just because it is easy to use for the end user." "We just started the rollout of this about six weeks ago," adds Ash. "It has been received very well, especially with the commercial base." Though it has not seen a huge amount at this point, Sisson says Karona is receiving many more requests for green products. "We are definitely seeing [green requests] much heavier on the commercial side of our business," he says. "The residential request for green products has been a little slower to come, but we are seeing more and more at the distribution, lumberyard and contractor levels. "I think there is a need for more knowledge through the distribution chain because in many instances the manufacturer may be able to provide a green product, but the chain of custody all the way through isn't together because somebody through the chain might not be certified or might not have the capabilities," Sisson adds. "On the commercial side there is a very viable demand," Ash concurs. "Some of that is driven because of federal or state dollars involved in the project that requires the building to have some green aspect to it, whether it is a LEED-certified Gold or Silver project or whether it just requires some green element to the project. Residentially, the demand has not been nearly as great, partly because at this point, from a millwork standpoint, there is a premium for it. For a homeowner, paying the premium on the millwork comes a little harder to do than from a commercial standpoint." Sisson says the company is holding relatively steady, having had both ups and downs during the current economic downturn. "We actually, through this downturn, have grown our commercial business, but obviously our residential business is considerably off from what it was at its peak," he says. "The way we have been able to deal with it is we have continued to try to diversify our product offerings, from value-added services, more expanded growth in fire-rated products and other factors that have helped us to grow commercially. We do see some growth in 2010." Ash adds that the company's developments in regards to fire doors also has helped sales. "Over the last 18 months or so we have really developed our 45-, 60- and 90-minute fire doors," he says. "It used to be an eight to 10 week lead time; we are five weeks today. Not many today are manufacturing or shipping rated doors that quickly. 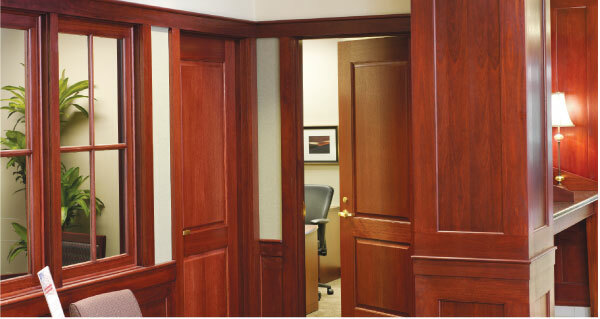 Also, our designs have increased our ability to do a one-panel, 90-minute fire door. Our 90-minute door is 1-3/4 inches thick now when it used to be 2-1/4 inches. So now our distributors can use standard hardware and jambs versus going and buying special hardware sets for those doors." Karona distributes its doors nationally, but does not sell direct to homeowners or builders. "All of our distribution is through a lumberyard dealer or a wholesale distributor residentially, and commercially through OEM distribution or door and hardware dealers," says Ash. According to Sisson, the company plans to continue investing in technology that will shorten its throughput and lead times while producing quality products. "The investment process has slowed down over the last couple of years because we scaled back our spending," he says. "But we always have a capital plan and know specifically what we need, when we need it, and what our capacities are. Ultimately, our goal is to take a door from the time that we get an order, release it to the floor and have it on the dock within a day."